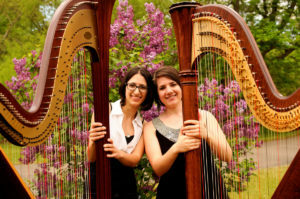 The retreat of the contemporary harp duo Lilac 94 was a satisfying and productive success from all angles. Their over-arching need was to rehearse in-depth the intensely challenging work Pentacle of Carlos Salzedo and to prepare a “conversation piece” around it to demonstrate the various extended techniques Salzedo employed in its composition. After first giving their spiel, which involved the audience (of about 95) in a thoroughly enthusiastic Q & A, Christina Brier and Kathryn Sloat delivered their first complete performance of the work in its entirety on Sunday, January 22. It was revelation! After the concert there was a veritable “petting zoo” with dozens crowding in to learn more about the pedal harp and its sonic capabilities. No time to rest on their laurels, however! The following day Mountain Lake PBS sent a team out to Saranac to film the duo at work in the music room of the guest house. Ultimately a full day’s footage will be edited into a brief ten-minute segment to be aired on Spotlight, an award-winning show that highlights arts and culture in our region. We’ll get the word out to you regarding the schedule of Lilac 94 featured on Spotlight – stay tuned!